Frame Size (H x L): 30.25" x 41"
Flag Size (H x L): 24" (20" x ribbon hoist) x 30.5"
26 star American parade flag, printed on fine silk, with a wide, red, silk ribbon hand-stitched along the hoist. The stars are arranged in what is known as the "Great Star" or "Great Luminary" configuration, in which the smaller stars are arranged in the profile of one large star. Great Star patterns vary widely in the way that they are assembled. In this case the pattern is comprised of a huge center star, situated so that it is canted with one point in the 11:00 position, with 5 smaller stars placed about it, one between each arm, so that they form a pentagon. 20 stars of a third and slightly smaller size are placed about this in such a way that they complete the star-shaped formation. Michigan, which became the 26th state to join the Union on January 26th, 1837. 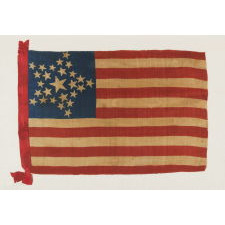 The 26 star flag became official on July 3rd of that year and remained so until the addition of the 27th state in 1845. 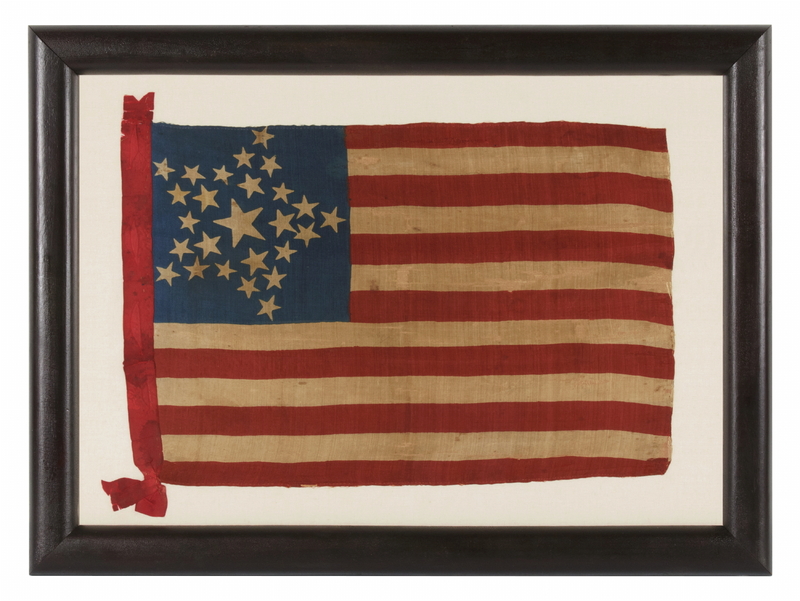 The earliest known printed flags have either 26 or 13 stars, the latter made during this same general time frame with patriotic respect for our colonial past. 26 is a rare star count and few examples survive. Most known printed examples of this era have printed, political advertising for the presidential campaign of William Henry Harrison (1840), Henry Clay or James Polk (1844). The remainder, including this flag, survive among less than 20 known examples. Most of these are more square in shape when compared to modern flags. Their profile may reflect the silk militia flags and regimental banners that were in use during the 18th and 19th centuries and would have simultaneously allowed women to use the flags as scarves to drape over their bonnets at parades or political rallies. Most that I have encountered, however, were at some point tacked to staffs in traditional parade flag format. 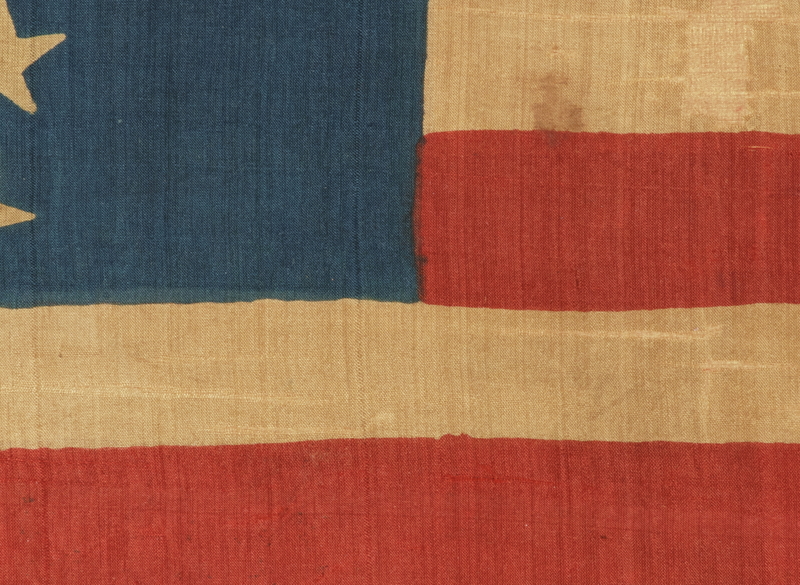 This exact style of parade flag is known in both cotton and silk. Both are extraordinarily rare, but the silk examples are particularly so. 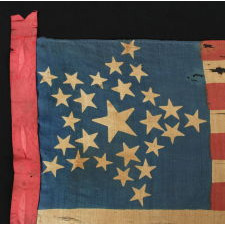 Beyond the one in question here, the only other silk example presently known is documented on page 102 of a landmark book on flag collecting called "The Stars and the Stripes" by Boleslaw and Marie D'Otrange Mastai, (Alfred A. Knopf , New York, 1973). This flag is very recognizable among serious collectors because it was so prominently illustrated in the first major book on flag collecting. 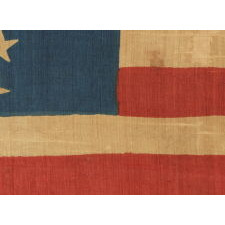 Use as a Naval signal had been the primary reason for the initial creation of an American national flag in 1777, but since there was no official star design, the appearance of our flag varied greatly. Reid’s primary concern centered on both consistency and ease of recognition. 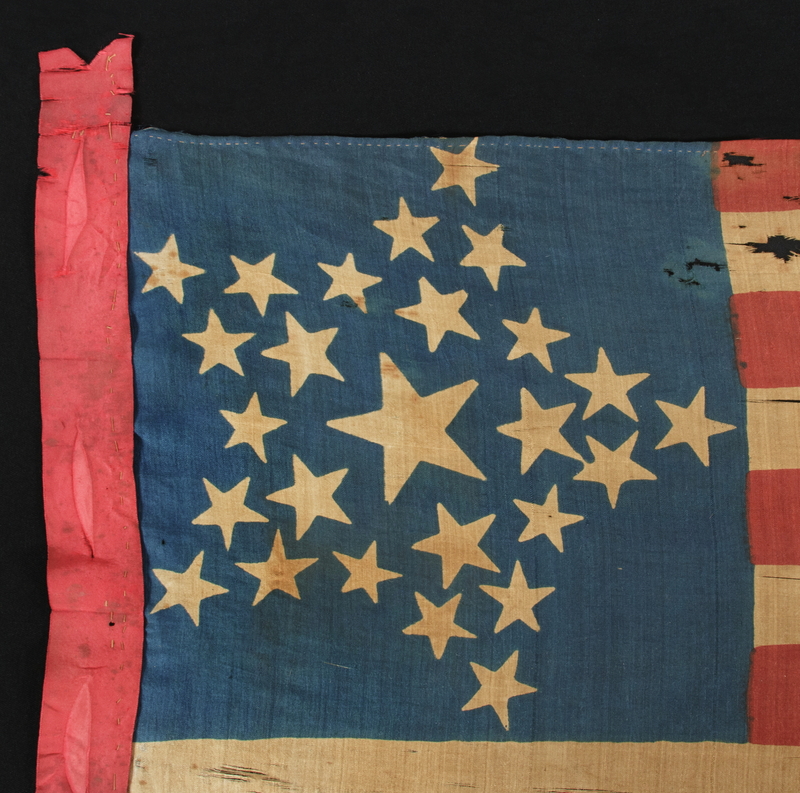 His hope was as more and more states joined the Union and more and more stars were added to the flag, that this important would remain easily identified on the open seas. In 1818, Reid suggested to Congress that the number of stripes permanently return to 13 (reduced from 15) and that the stars be grouped into the shape of one large star. Reid’s proposal would have kept the star constellation in roughly the same format, in a pattern that could be quickly identified at a distance as the number of states grew. 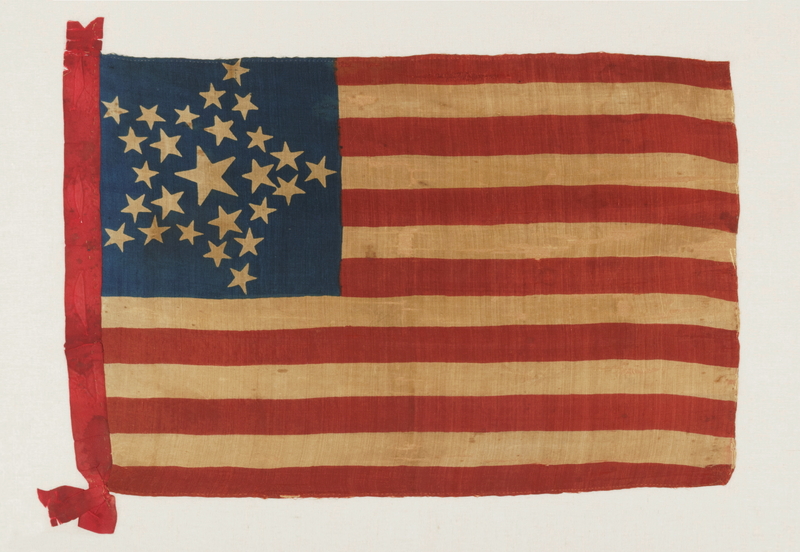 His concept for the stripes was ultimately accepted, but his advice on the star pattern was rejected by President James Monroe, due to the increased cost of arranging the stars in what would become known as the “Great Star”, “Great Flower”, or “Great Luminary” pattern. Monroe suggested a simple pattern of justified rows but did not issue an official deign, so the Great Star was produced by anyone willing to make it and its rarity today, along with its beauty, has driven the desirability of American flags with this configuration. 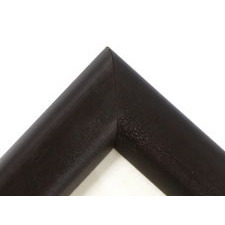 Mounting: The convex profile molding dates to the mid-19th century and retains excellent early patina. 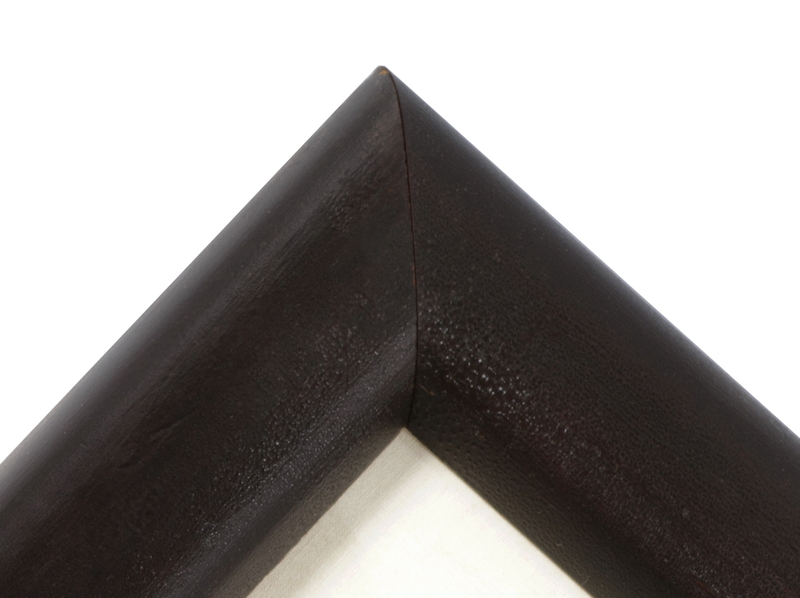 The very dark brown, original surface has red overtones and great craqelure. This is a pressure mount between U.V. protective acrylic and 100% hemp fabric. Condition: There is minor soiling in limited areas. There is moderate to significant breakdown throughout in the silk fabric with associated loss, particularly in the white stripes. Many silk flags made during the mid-late 19th century have splits of various severity because the silk was weighted by merchants with mineral salts and other agents to make it heavier. This practice began sometime between 1820 and 1850, who began to sell silk by weight rather than by length and weighted it to increase the price that they could obtain. Weighting agents were caustic to the fabric over time, which resulted in associated breakdown. 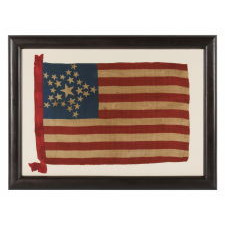 Many of my clients prefer early flags to show their age and history of use. The exceptional rarity and desirability of this particular flag well warrants the condition issues.